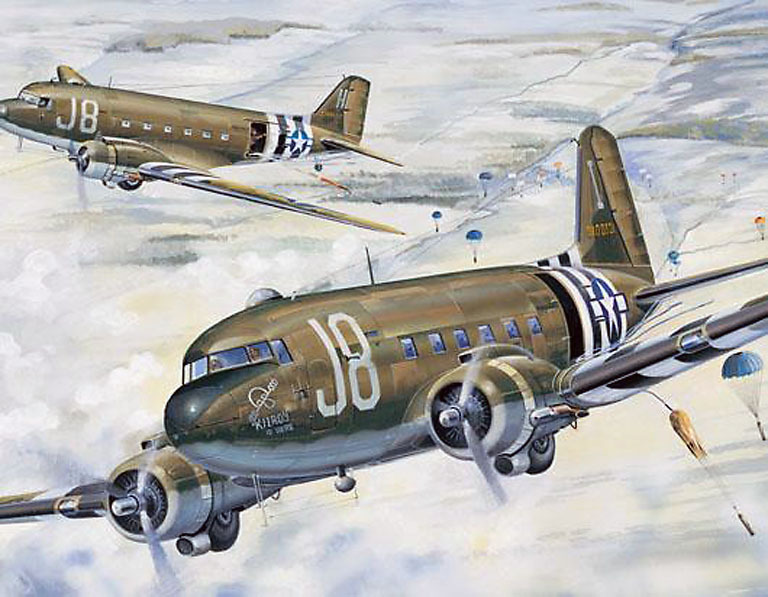 "From my long time volunteers, the markings of our C-47 are the D-Day markings carried by a 92nd Troop Carrier Squadron, 439th Troop Carrier Group (Now 439th Airlift Wing) The C-47 named "Kilroy Is Here" J8 I was part of that squadron. 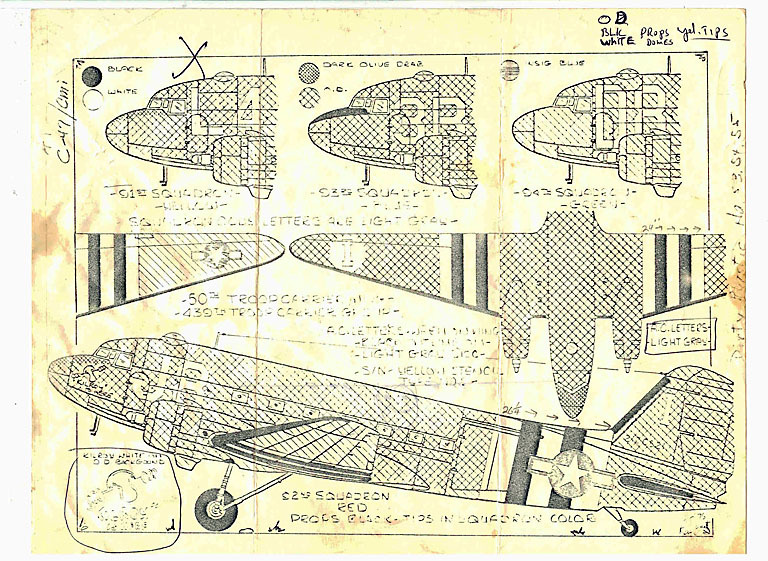 I have on file a copied page showing a profile drawing of a C-47 with the "Kilroy" markings (above.) 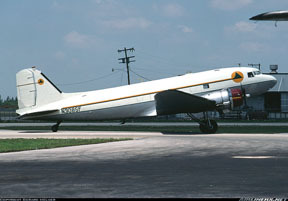 The tail number is 2100521 which was a C-47A-65-DL. The quality of the copy is not very good, and I cannot read the artist's name." "I am pretty sure Mr. Robert "Bob" Schneider, one of the museum founders, got the marking information from the Air Force Museum. 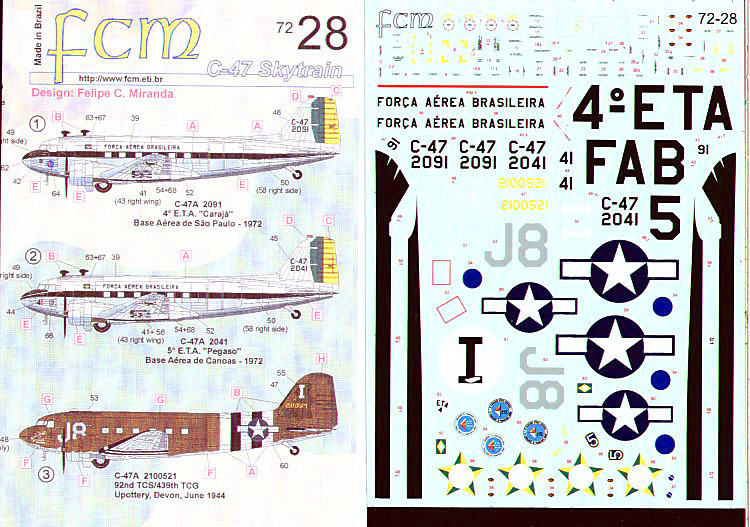 I did not realize until sometime later that I made the width of the letters on our C-47 too narrow." 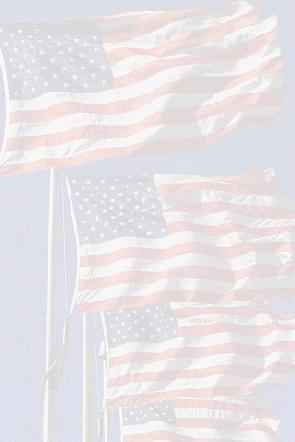 Special thanks to David Dunham of David Dunham Fine Art whose beautiful photograph first turned me on to the story and to Danny J. San Romani, Curator, Combat Air Museum in Topeka, Kansas for making sense of it all. 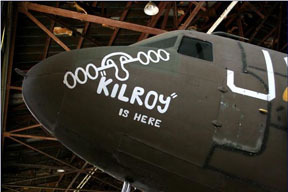 This C-47 bears a confirmed image of Kilroy Was Here as nose art dated during WWII (See the Curator of the Combat Air Museums comment to the left.) There is, however, a lot more to her story than just a Sighting! 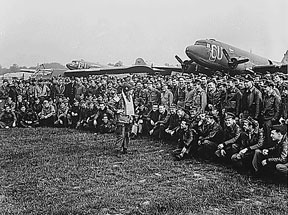 This Great C-47 was at Normandy during D-Day and probably carried troops to Operation Market Garden. She dropped paratroops and pulled gliders and here she is in all her glory proudly displaying Kilroy is Here and her invasion stripes. She and all C-47s were then used as ambulances getting the wounded back for care. This is another documented Sighting of Kilroy during WWII. 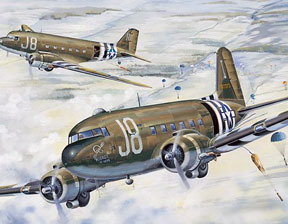 The C-47 and especially one named Kilroy is Here was not designed for war, but like her brethren of the Greatest Generation she answered the call and performed magnificently. 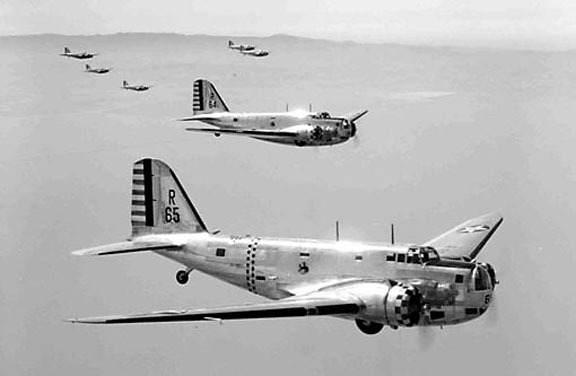 The DC-3/C-47/C-53, and, affectionately: Gooney Bird are all of the Greatest Generation. They were a little younger than most, conceived in the early 1930s but born in 1936. The C-47 named Kilroy is Here, was born in 1943 and went to war when she was delivered to 8th Air Force in January, 1944 (S/N 42-100521). She and her siblings were designed for civilian work and got into the war at a much younger age that her human counterparts -- in a time when the age of all warriors was very young. Like others of the Greatest Generation, she was never meant for war but a warrior she became! Her older brothers the DC-1 and DC-2 (which inspired the B-18 Bolo) didn't last as long. Flying Tigers and played a major role in the Berlin Airlift. 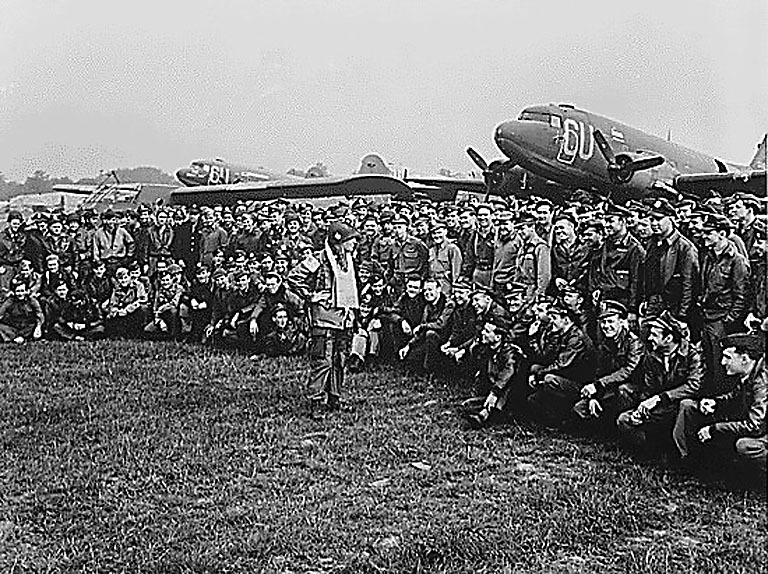 She and especially the C-47 named Kilroy is Here that we are featuring, participated in D-Day. There seems to be some question about exactly how many were made but counting all versions, well more than 13,000 can be accounted for. She, like the rest of the Greatest Generation, came home from war and set out making the USA what she became . . . the greatest power for good ever! And that's just counting the US and her Allies. She was and is still in use by many other countries. She and her sister C-47s remained in front line operations through the 1950s and many remain in operation to this day including Kilroy is Here. Click here for another view of her in her new civies by Zane Adams. 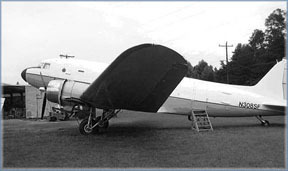 DC-3 N308SF for sale (but not sold) on eBay, July 2008. Text from actual ad. 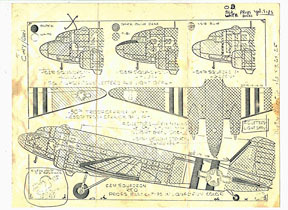 N308SF, serial number 18984, for sale on eBay, by C.J. Aviation Services LLC, asking price $88,000.00 but highest bid was 50.100,- and thus remained unsold. "Vehicle Description: 1943 DC-3 that is current Part # 135! This bird is well maintained and ready to go. Lots of history with this girl. 1943-46 flew in the war." 1946-1952 - flew for several small airlines. Back to the US in 1984 and has been used for freight ever since. History incomplete. If you have more, let me know! According to city-data.com, and Aircraft Directory, she now is registered as: "Aircraft: DOUGLAS C-47 (Fixed wing multi-engine, Category: Land, Engines: 2, Seats: 32, Weight: 20,000+ Pounds, Speed: 150 mph), Engine: Reciprocating N-Number: 308SF , Serial Number: 18984, Airworthiness Date: 03/26/1953. 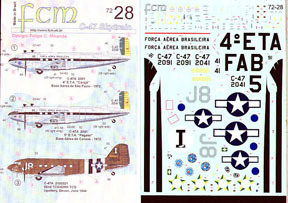 Registrant (Corporation): Universal Asset Management Inc, 5350 Poplar Ave., 150, Memphis, TN 38119"
She, sporting her D-Day paint, is also very popular among modelers. If you are skilled, you can build this beautiful example. 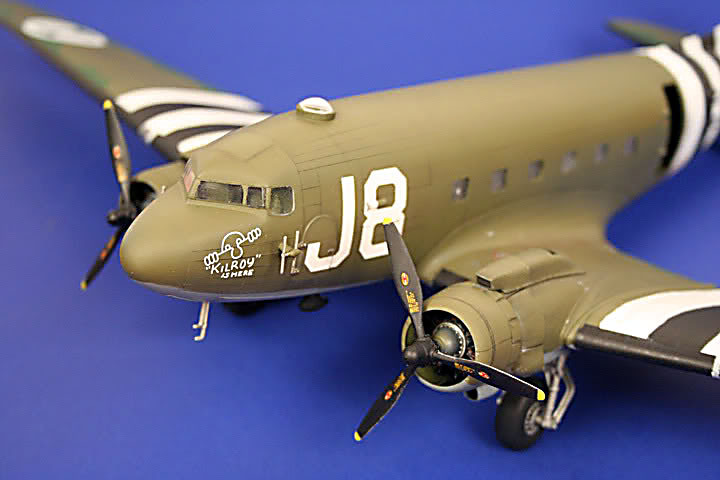 This one built by Mark from a Trumpeter 1:48 scale model kit number 02828.